In my group, we are investigating how the cell gets organized using the cytoskeleton. To do so, we are using the fibroblast and the muscle cell systems that have particular and complementary features. Since several years, we are studying nuclear movement and nuclear positioning, especially in muscle cells. 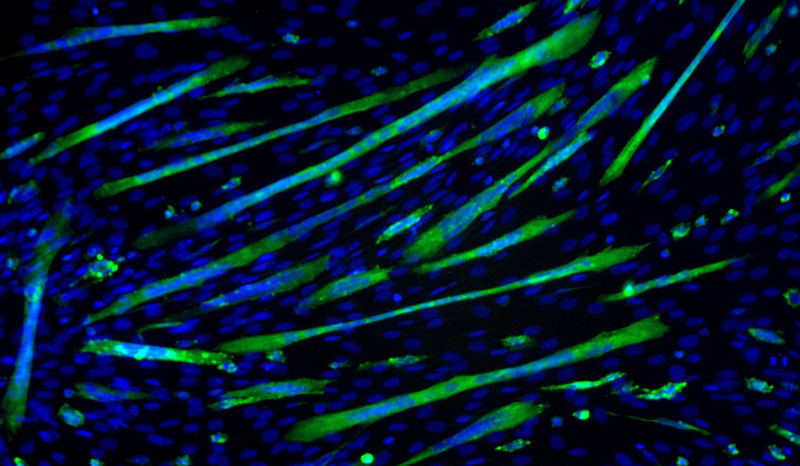 Muscle cells have the particularity of containing hundreds of nuclei, resulting from the fusion of hundreds of myoblasts, that are evenly spaced just under the plasma membrane. To achieve this particular organization, nuclei have to undergo specific and succcessive types of nuclear movements. The two first movements, centration and spreading, are microtubule-dependent but require different molecular motors and have therefore different characteristics. These movements are tho ught to rely on a major modification of the microtubule organization: since 1985 it is known that centrosomes, the microtubule organizing centers in the cell, disappear during muscle cell differentiation. The microtubule organization is transfered to the nucleus that recruits some centrosomal proteins and microtubule-nucleation factors. We recently found this is achieved by a particular isoform of Nesprin-1, an nuclear envelope-associated protein, expressed during muscle cell differentiation that recruit Akap-450, an anchor for microtubule-nucleators. The nuclear dispersion movement, on the other hand, relies on myofibrils contraction and nuclear envelope modifications.